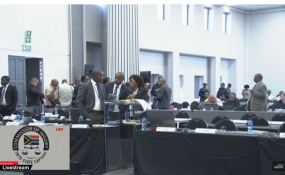 Video screenshot of the Zondo Commission of Inquiry. Former president Jacob Zuma has responded to the judicial commission of inquiry into state capture, saying he will apply his mind to the invitation to respond to allegations made at the public hearings. "As his senior counsel advised the commission during its day of hearing, [former] president Zuma supports the commission and wants to participate meaningfully in the process," Zuma's attorneys said in a statement on Thursday. "He reiterates this position and therefore he will apply his mind on the invite and shall convey his reply to the chair of the commission as soon as he has consulted with his team." According to the statement, Zuma made an election in terms of the rules of the commission that he would not apply to cross-examine the witnesses who allegedly implicated him. "It would seem that despite him co-operating with the commission, his election (in terms of the commission's own rules) is misunderstood as non-co-operation. "We find this very unfortunate since former president Zuma has sent his legal representatives to every sitting of the commission where the alleged evidence which may implicate him was being given, and further, he has honoured through his legal team all the requests which were brought to the attention of his legal team by the commission." The chairperson of the inquiry, Deputy Chief Justice Raymond Zondo, said he would like Zuma to give his side of the story. "I have invited the lawyers of the former president [to request] that he could put his version in an affidavit," Zondo said. This was after evidence presented by former ANC MP Vytjie Mentor claimed Zuma was at the Guptas' home when she was offered a ministerial post. The inquiry is expected to resume on Monday.